It has been super hot where I live! I've been trying to enjoy it as much as possible since we only get a couple of months of summer... With the hot, steamy weather I've been thinking about talking about my favourite summertime beauty products! I have so many, that it was really difficult to narrow it down to just five. What can I say? Summertime is just a special time! I'm usually a Bath and Body Works kind of girl when it comes to body wash. However, one day I was strolling down the toiletries aisle at Walmart and came across this St. Ives Pink Lemon body wash. I smelt it and I was sold! This particular scent smells like everything tropical, sunshine and beach - combined! It smells so good! Using this in the shower sets the tone for my summer evenings. I also love that there is a little bit of texture which helps to get rid of all the dead skin. I love this corally-pink-orange-y shade for summer! For me, nothing says summer more than coral. Naturally, it's always a given that I will use this colour very often in the summer months. 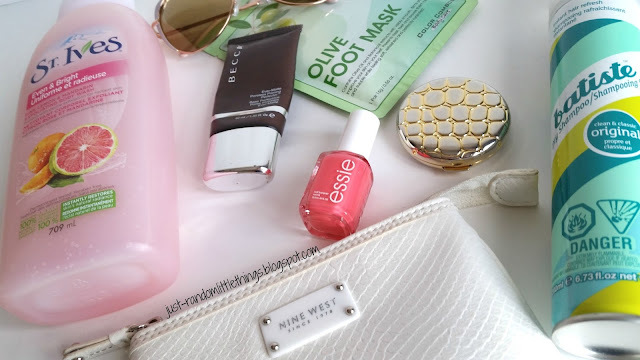 If you haven't already, you should check out my previous blog post where I talk about my favourite essie nail polishes for summer. As you can already guess, this is one of the shades I talk about. I'm one of the lucky few who have been blessed with oily skin... :( :( :( . So, all year around I always try my best to use a primer under my foundation. This is particularly important in the summer months when the weather gets extremely hot. My favourite primer is Becca. It's great because it's light weight and glides on easy. You only need a little bit of product, so your purchase will last you a long time! There's only so much that you can blot throughout the day! I find in the summer months that my feet tend to become rough very quickly. I'll get a pedicure one day and a few days later, my feet are rough again! I found that the best way to keep feet looking their best in summer sandals, is by using a foot mask. If you follow me on Instagram, you would know that I recently bought an olive oil foot mask in Vancouver that I can't wait to try! Stay tuned as I plan to write a review. If you're not a fan of foot masks, I also like to soak my feet in Epsom salts and warm water. Going hand in hand with my oil skin is my oily hair... I find that in the colder months I can really control the oil by using a shampoo for oily hair. However, in the summer months I find this much harder to do. To help with this, I like to use the Batiste dry shampoo. I mostly use it on my second day hair. Spray, style your hair and your ready with perfect summer hair to combat the heat! Well, I hope you've enjoyed reading about my favourite summertime beauty products. Be sure to sign up for email notifications to keep updated with the blog! Thanks again to Katelyn for collaborating with me on this post. 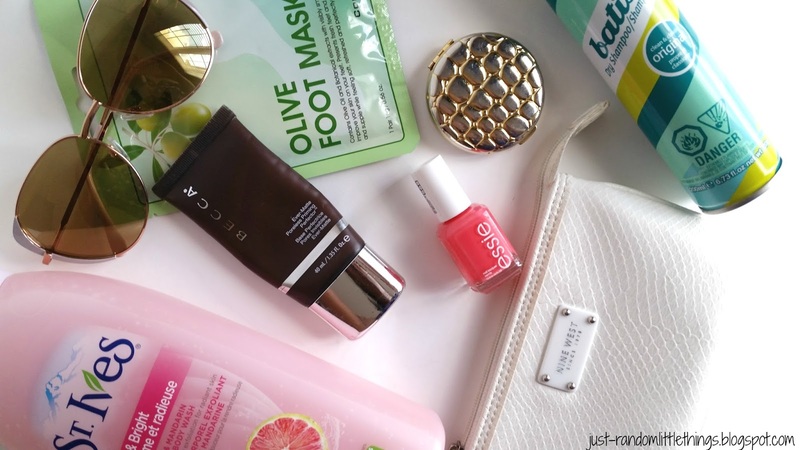 Don't forget to check out her blog to read all about her favourite summertime beauty products - Katelyn Blogs! If you like our collaboration, please let us know in the comments below. 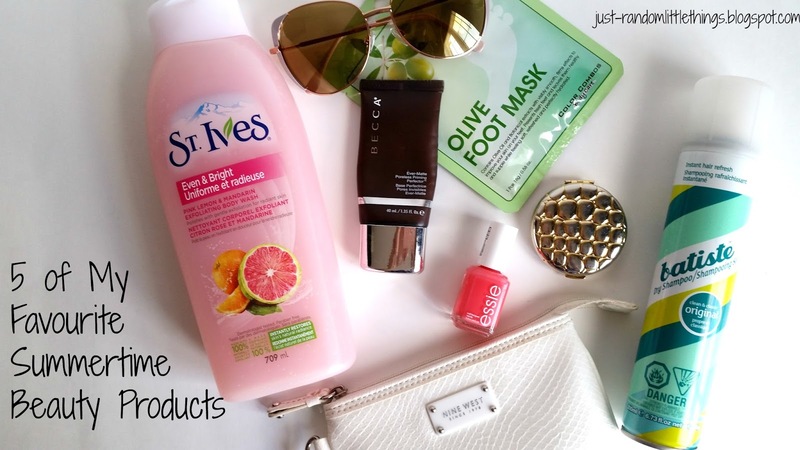 What are your favourite summertime beauty products?